VAL DI FIEMME, Italy — Members of the Visa Women’s Ski Jumping Team will compete against the rest of the world’s best next week in Italy at the 2013 Nordic World Ski Championships, the sport’s most prestigious event before the Olympic Winter Games opens its doors for the first time ever to women jumpers a year from now. 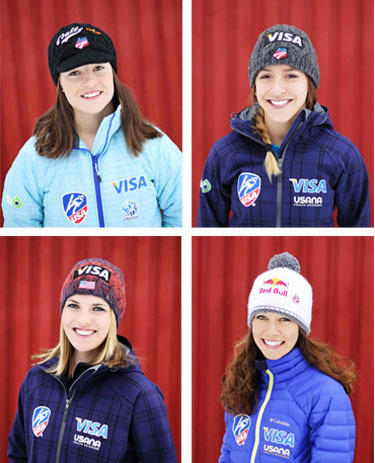 Lindsey Van, 28, Jessica Jerome, 25, Abby Hughes, 23, and 2012 World Cup Champion Sarah Hendrickson, 18, all of Park City, Utah, have been named to the World Championships team. By all accounts, the third Worlds to allow women to compete is setting up to be hugely competitive. “What separates the true champions from the rest is the fact that they can treat all the competitions and training jumps the same and not put more pressure or emphasis on a single event,” said Alan Alborn, Head Program and Development Coach for Women’s Ski Jumping USA. That’s what Alborn and Head World Cup Coach Paolo Bernardi will be preaching to their team, but it’s no secret that whoever captures the gold medal next week will become the immediate favorite for Olympic gold next February in Sochi, Russia. “I love this hill and have confidence going into the comp,” said Hendrickson, who had a double World Cup victory here in 2012, including setting the hill record with a leap of 108 meters. Hughes is coming into her second World Championships with one of her strongest international seasons ever. She has four top-20 results this year, including a 9th in Sochi, Russia and 11th in Ramsau, Austria. The opening ceremony is Wednesday, Feb. 20, in Val di Fiemme, and the women’s individual jumping event is Friday, Feb. 22. A mixed-team event made up of the two top men and women from each country will take place Feb. 24. Val di Fiemme marks the third World Championships for Jerome and Van, who became the sport’s first female World Champion in 2009. Jerome was a stellar 6th that year. It was the first Nordic World Ski Championships in which women jumpers competed and all eyes (and critics) were focused on their performance. In 2011 in Oslo, Norway, the two veterans were shouldering the weight of the political battle to get their sport into the Olympic Winter Games. That pressure, mixed with unbelievably difficult fog and wind conditions, proved to be a recipe for disappointment. Jerome came into Oslo ranked 5th in the world and finished 14th. Van had a bad first jump and didn’t make the second round – for the first time in her career. This time around, both jumpers are due a little fun and say they’re looking forward to competing for the simple love of competition and sport. “I was pretty disappointed with my results from the last Worlds and I am excited for the chance to improve on that result and enjoy it,” said Jerome, who spent 10 days in Oslo recently for specialty training and to hone her in-run technique. It paid off. Last weekend in Zao, Japan, she posted her two best back-to-back results so far this season with a 5th and 6th. Van, who’s currently ranked 10th in the world, has said she can’t even watch footage from that first jump in Oslo two years ago. The U.S. women compete in two World Cups Saturday and Sunday in Ljubno, Slovenia and then on to Val di Fiemme.